The obligatory titular capitals of the event’s ensemble and venue could not be more appropriate for last night’s performance. From beginning to end, PARTCH exclaimed, cursed, laughed, wailed, and cavorted through several varied scores by the “iconoclastic American Maverick” Harry Partch (1901-1974). PARTCH, led by guitarist/composer/singer/radio-personality John Schneider, have been spreading the gospel of Partch since their REDCAT debut in 2004. The pre-concert atmosphere in REDCAT was even more casual than usual. Covering the stage were the beautiful replicas of Partch’s original, handcrafted instruments and the band was basically just milling around. 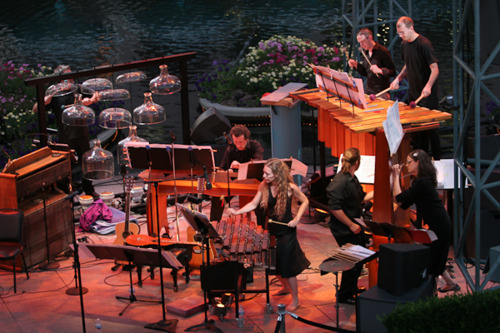 The lights suddenly dimmed and several audience members quickly dove into their seats as the musicians likewise dove into the rambunctious and engaging Castor & Pollux (1952), a pair of pieces for Kithara, Cloud Chamber Bowls, Harmonic Canon, Bass Marimba, and Diamond Marimba (all shown above). The two pieces are each in four movements with the same titles, “Insemination”, “Conception”, “Incubation”, and “Delivery”. Relating to the mythical birth of the Gemini twins, this carnal imagery is even more appropriate to the music itself; the rhythmic and harmonic language of this music is equally intoxicating and sensuous. The programmatic arc of music that followed Castor & Pollux was well-conceived and satisfying, as well as quite informative to the uninitiated Partch-lover or microtonalist – the “informing” mostly due to the short, enjoyable documentary film Music Studio (1958, Madelaine Tourtelot) shown before intermission. Up until the Partch classic Barstow (1941/3), which ended the program, the other pieces were more intimate. With the geniality and nonchalance of a home concert, John Schneider accompanied himself on Adapted Viola (Partch’s first foray into instrument building) while singing excerpts from the early Li Po Lyrics (Partch’s first foray into composing). After intermission, we were treated to the chamber-jazz adventure Ulysses Departs from the Edge of the World (1955), which featured Josh Aguiar performing the trumpet part originally written for Chet Baker. Though Chet never performed the piece, Josh convincingly stood in his stead with a sound that was caressingly warm. This was followed by two more works featuring “intoning voice”: the mischievous and whimsical Two Settings from Lewis Carroll (1954) and the grotesque Potion Scene from Shakespeare’s Romeo and Juliet (1931) for voice and Adapted Viola. The latter was definitely the dramatic high-point of the evening, with Argenta Walther and Andrew McIntosh masterfully merging their parts to form the sonic essence of Juliet’s doubting, fearful soul which came oozing through the air. As a mitigating factor, Barstow came immediately after, featuring various members of the ensemble singing the texts by hitchhiker graffiti artists, mostly with a comic air.